How wonderful it is that nobody need wait a single moment before starting to improve the world …. Barbara is also the Founder and President of Champions of Caring, a not-for-profit organization that has educated and empowered over 10,000 youth to become social activists. 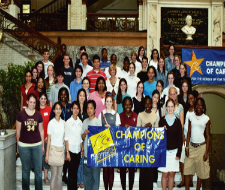 Champions of Caring offers consulting services, curricular materials, professional development, and technical support to establish “Cultures of Caring” in schools and youth development organizations. Champions Day workshops engage students and teachers in a series of activities and reflection exercises to sensitize them to the issues in their school and community, empower them to take action to address these issues and inspire them to create “cultures of caring”. These events can be tailored to address the unique issues facing schools and communities. Professional development is provided for teachers and facilitators in the Champions of Caring methodology and use of our character education and service-learning curricula. This training also helps educators to explore strategies for addressing issues of violence, racism and bullying in their schools and communities. The Champions of Caring Speakers Bureau is comprised of students, teachers and Champions of Caring staff who are available to share their experiences with service and involvement with Champions of Caring to inspire youth to make a difference in their own school and community. Champions from diverse backgrounds speak about how they have taken their own passions and interests, for activities ranging from salsa dancing to tennis to fashion design, and turned them into sustainable service projects to address local or global social issues. These projects include creating an intergenerational program to teach salsa to the elderly, organizing clinics to teach tennis to youth with disabilities, and designing T-shirts to raise awareness about genocide in Darfur. By sharing examples and strategies, they teach youth how to act as a Champion, and stand up and speak out against injustices, in any social, educational or professional situation. We also offer speeches and workshops for educators, parents and community members to help them to identify the roles that they can play in encouraging youth to become Champions of Caring and inspire them to get involved in service. Our staff will motivate them to reflect on their own passions, interests and skills and create intergenerational projects that make positive changes in their communities.